I designed the Prius to sleep by removing the back seats and replacing them with multi-hinged plywood that would form a bed platform that would give me 6 foot 2 inches of bed space behind the passenger seat to the rear hatch. This space would accommodate me at 5 foot 11 inches and the mattress and sleeping bag. I chose this design over others involving folding the front passenger seat forward as it gave me a truely flat surface and although the front passenger seat was pushed nearly all the way forward. The back of the seat was at the center post and this allowed me to run a curtain across the back of the seats and when I stealthier in parking lots it looked like the vehicle was just parked as the front seats didn't look odd in that position. At night I could also lean my back on the back of the front passenger seat and this semi reclined position basically gave me another position of comfort vs only laying down. Being able to fully recline was important for me along with having a full-size sleeping bag. This gave me ability to move around and change positions for variety of comfort. I chose a very well insulated full size sleeping bag as I am normally cold and I was traveling where it got down to 19 degrees at night. 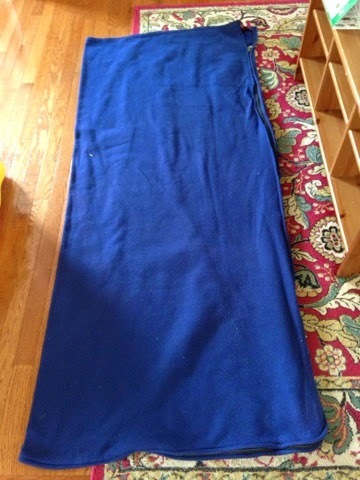 I had a homemade sleeping bag liner made from a full-size flannel bedsheet that was folded in half and sewn across the bottom and knee high on the zippered side. This worked very well and I washed it weekly with my clothing. 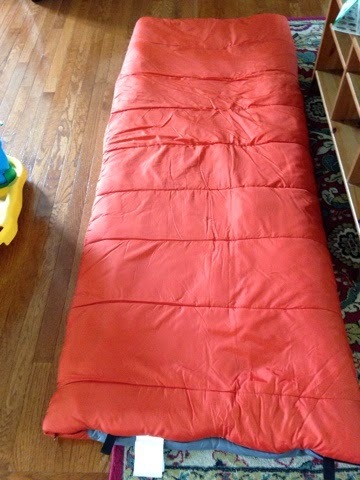 I also carried this fleece sleeping bag for when it was too warm for the regular sleeping bag. Near the end of my stay in Arazona it was in the 90's during the day and 60's at night. For storage I just laid it undefvthecsleeping bag as it was the same size. 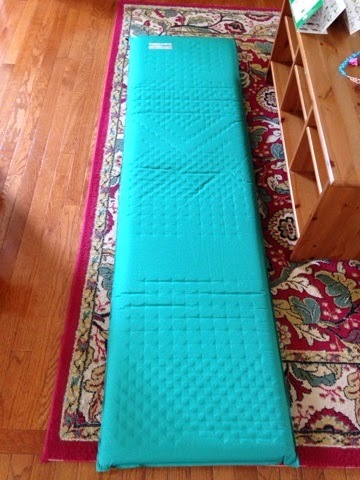 My mattress was a Therm-a-rest mattress that was self inflating as it has a foam core. It worked very well but it wasn't the same width of the sleeping bag so my body could end up off of it at night on either side. I would prefer a pad that was wider as I had the space for it under the sleeping bag. I have to say that I can generally sleep on any surface but I also knew that my 106 days on the road would start to wear on make quickly if I didn't have a good night'so sleep. I did already have a mummy bag that was warm enough but I knew I would appreciate sleeping in more like a bed vs a bag. I did design the rear of the Prius so you could fit two people in the back, but this would require a change in other aspects of living in and out of your Prius. Although I did not try two people the room is there. I would suggest two sleeping bags zippered together for the space. There would not be any place to sit in the back so once your in bed you are in either a semi reclined position old laying down. Since I was by myself I could use the area behind the drivers seat as a seat for yet another position of comfort. When I would stealth I would open the rear door behind the drivers seat and get in angle sit down then sit on the edge of the bed platform and change to get ready for bed. With two people stealthing would just mean getting into bed and changing clothes laying down. This may be doable but it would be interesting to see wirk for day after day. It seems to me that two traveling in the Prius would use the back for sleeping thus eliminating the need to set up a tent. Stealthing could be possible but with a lot of work. Since my fridge is located in the rear drivers side under the hatch, you can see in the picture that having this stay in the car with two trying to sleep would not work. As I have stated in a previous blog if I was using the Prius for two people I would have a clamshell roof storage unit to store items as the space will be more than welcomed. 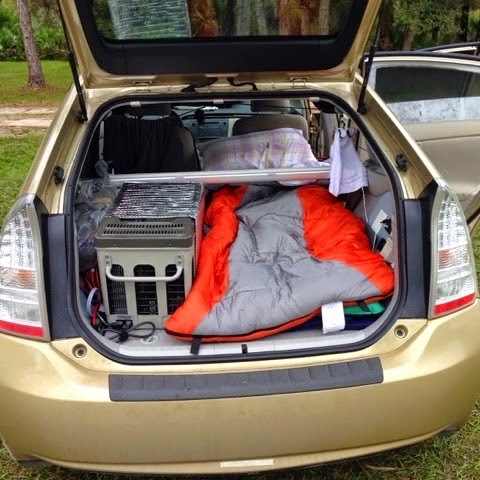 You can rough anything for a weekend but living in and out of the Prius for months takes very deliberate planning and decision making on what you bring as every cubic inch counts. I've never seen anyone's setup in person so tough to tell, but in your experience, could you fit a folding bicycle in your setup if you didn't have the fridge (Soylent)? If not with the cargo cover, would do much like this individual did with the black cover? There were 4 Pruis (non V) at the CRVL RTR in Quartzsite this year. All three of us approached our Prius living differently. Dave set up his Prius with a folding bike where I have the fridge and I believe it extends into the rear drivers side seat area. There is a YouTube video that Bob Wells produced on his design. I chose to keep the front passenger seat and remove the rear seats. I could fit a folding bike in my design with out the compressor fridge, but I would use my modified rear drivers side seat I designed where I wash and sit so I can just sit without sitting in the bed. The only other way would be to put the bike outside when I washed. Now if you get the Prius V you do pick up some cubic inches that a folded bike could possibly fit hung from ceiling, but I never looked at the designing of such although I like to bike. For me I think a clamshell on the roof with the folding bike inside would be my option but I didn't want to give up any stealth. Yeah, I've seen that video where Dave folds down his front seat. I'm with you, I want max stealth so my front passenger seat would remain upright with a curtain drawn behind the driver/passenger seats at night. So you would put the folding bike on top of the platform you created in place of the rear driver's side seat? If that were the case, I guess you don't need to keep your stealth when showering and can put the bike outside for a few minutes, as one staple rule of stealth is you get ready for bed (including showering) in one place, then drive to your sleeping area where you go into stealth mode? The other way to do it might be to put the folding bike on the platform you have in place of the driver's side rear seat, and just move the folding bike on to the sleeping platform when showing, and then move it back when done...feasible? I would not go the clamshell route either for MPG and stealth considerations. I'm glad you saw Dave's setup. I have traveled two years in my Prius, with the first being 3.5 mints and this year 4 months. Yes. I could put the bike in like Dave does and yes it is possible to move it out of the way when washing/sitting and move it back for when I go to bed. I have found that I hate moving things around that don't have a home. For example say the bike is up behind the drivers seat and I want to arrive at a casino parking lot and just slide the driver's seat back backwards and slide my whole bitty back without getting outside the car. (One of my stealth maneuvers.) or visa bird when leave in the am. The bike would be in the way. What I was wondering is if you get a Prius V you have more vertical room, so could you have some kind of platform forbid to sit on so it wouldn't interfere with either going to bed or sitting. Of course no compressor fridge in the back. You may have difficulty seeing out the back when driving and at night you would need a curtain to not have the bike visible. I'm just rambling thoughts not having either the V or the folding bike to take measurements. Suanne in her Prius impressed upon me to have that seating area behind the driver and for me she was right. It provides living comfort I don't get just from sitting in the drivers seat. That area is also the area I use for washing and bathroom so having it free comes before the bike for me. This may be you telling all of us how to make it work someday. So Brent...when are you buying a folding bike? ;) We'll see, I'd love to find a friend with a V to map some things out, we'll see. If I did have a bike solution I would want the bike to have electric assist using Li battery technology that I could recharge off the Prius electric system. Obviously we run in some of the same circles and I've see the battery powered folding bikes... a few things concern me with them...1) cost, a regular folder can be had for ~$400 new. 2) weight... I'm a wuss, don't want to lug it in and out of the car or carry it into a museum 3) I haven't done the calculations, but figure it'd take a decent amount of gas to recharge that LI battery over time, no? Yes cost is a factor but if it works for someone and brings enjoyment then it is worth it. For gas to charge, yes it uses some minuscule amount to charge me 24 Ah house battery. Charging a 36 Ah bike battery would not be a big deal for me. Heck a few days this year I needed to run my Prius air conditioner to not over stress my compressor fridge and it wasn't a big deal. My multi chemistry charger charges at 2 - 4 - 8 amps so a 36 Ah bike battery and 24 Ah house battery could be charged in 8 hours. How wide is your bed Brent? I sleep on my stomach with one leg pulled up to my side. Thx. 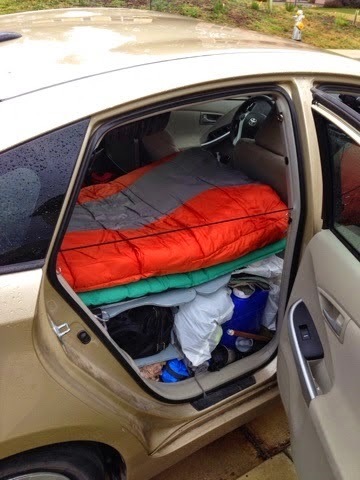 I sleep on the rear passenger side (60% side for split fold-down rear seats) and at the seat back bent at the floor is 24" to the edge of the exterior wall. With the seat folded down the side to side width is larger and the 60% side is 28 inches at the rear passenger door. This works great as a human's upper torso is wider than our waist. With my Engel compressor fridge on the rear 40% side I have plenty of room for my legs to bend. For this reason I bought a rectangular sleeping bag over a mummy bag as I too like to bend my legs. This bending also makes it easier to get on and out of bed.